Jake and Izzy along with their friends, Cubby and Scully, complete the band of Neverland Pirates. Jake is the young boy who is tasked by Peter Pan to protect Neverland and is the leader of the group. Izzy is the brains of the group and is the holder of the pouch of fairy dust given by Tinkerbell. Jake has on a white, short-sleeved tunic underneath a blue vest, a pair of blue pants, brown pirate boots, and a red bandanna. Izzy has on a pink shirt, purple leggings, brown pirate boots, and a pink bandanna. Here’s everything you need to look like Jake and Izzy. 1 White Short-Sleeved Pirate Tunic Jake prefers a simple white, short-sleeved tunic underneath his vest. 2 Blue Pants Jake also prefers a simple pair of blue pants. 3 Blue Pirate Vest Jake adds color to his outfit by the use of a blue vest with a gold lining. 4 Brown Knee-High Pirate Boots As part of his captain uniform, Jake prefers dark brown pirate boots. 5 Black Belt To divide his look better, Jake wears a black belt around his waist. 6 Red Bandanna Jake wears a red bandanna to keep his hair away from his face. 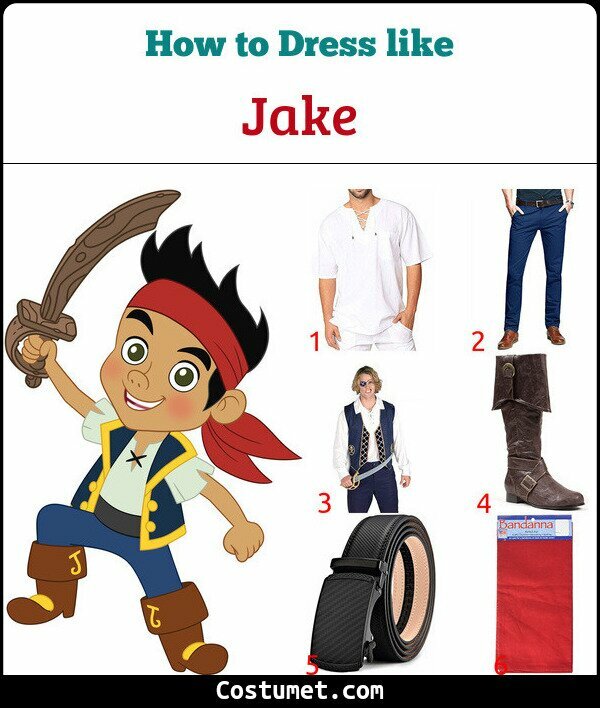 7 Jake Toddlers Costume Set Transform your kid into a swash-buckling pirate with this Jake costume set. 1 Pink Short-Sleeved Tunic Top Izzy prefers a long, flowy, pink shirt for her daily pirate outfit. 2 Purple Leggings Izzy matches her top with comfy purple leggings. 3 Brown Buckle Boots As a pirate, Izzy is partial to brown buckle boots. 4 Pink Bandanna Izzy keeps her hair away from her face with a pink bandanna. 5 Pink Bubble Hair Ties A pair of pink bubble hair ties keeps Izzy’s hair in place. 6 Gold Hoop Earrings Izzy also likes to accessorize with a pair of hoop earrings. 7 Pirate Booty Pouch Put this pouch around your neck just like Izzy’s which contains fairy dust. 8 Izzy Little Girls Costume Set Transform your little girl into a feisty pirate with this Izzy costume set. Jake has had many voice actors throughout the years, but the very first one was Colin Ford. Izzy has had only two actors, and the first one was Madison Pettis.